While investigating the murder of an American missionary in Ethiopia, rookie State Department lawyer Jaqueline Quartermane becomes obsessed with a magical word square found inside an underground church guarding the tomb of the biblical Adam. Drawn into a web of esoteric intrigue, she and a roguish antiquities thief named Elymas must race an elusive and taunting mastermind to find the one relic needed to resurrect Solomon’s Temple. A trail of cabalistic clues leads them to the catacombs of Rome, the crypt below Chartres Cathedral, a Masonic shaft in Nova Scotia, a Portuguese shipwreck off Sumatra, and the caverns under the Temple Mount in Jerusalem. The year is 1452. One of the most secretive societies in history, Portugal’s Order of Christ, is led by a reclusive visionary, Prince Henry the Navigator. He and his medieval version of NASA merged with the CIA scheme to foil their archenemies, the Inquisitor Torquemada and Queen Isabella of Castile, who plan to bring back Christ for the Last Judgment by ridding the world of Jews, heretics, and unbelievers. Separated by half a millennium, two conspiracies to usher in the Tribulations promised by the Book of Revelation dovetail in this fast-paced thriller to expose the world’s most explosive secret: The true identity of Christopher Columbus and the explorer’s connection to those now trying to spark the End of Days. Glen Craney’s novel The Virgin of the Wind Rose is a read to both savour and ponder. Its fast-paced and engaging plot, coupled with complex and sympathetic characters, immerses the reader in a modern day quest for ancient relics, involving secret societies and conspiracy theories. It also brings alive the world of ancient mariners and throws light on the identity of Christopher Columbus. I enjoyed how it combines a contemporary narrative with key personalities and events from Fifteenth century Portugal and beyond. The search for an important relic comes to dominate the minds of the novel’s main contemporary characters, as those who would thwart their efforts will stop at nothing to prevent them reaching their goals. Indeed, they desire the relic to bolster purposes which can only be described as sinister. Jaqueline Quartermane, supported by the mysterious Elymas, an antiquities thief with a conscience, become obsessed with solving the mystery of a word square, to comprehend its hidden meaning. Their quest leads them to sites throughout the world. As they grow ever closer together, they discover that a rival is also out to break the code and acquire ancient relics. This unknown and sinister mastermind desires to use the relics for their own ends, inflicting potential devastating effects on humanity and the world order. I enjoyed how Jaqueline worked alone and with Elymas, and what begins as friendship soon blossoms into romance. Yet will the couple survive the powerful forces that are out to thwart them? In the book’s parallel narrative, in Fifteenth Century Portugal, we follow a group of young men, including Columbus, whose lives become dedicated to working for the Order of Christ, which works to protect ancient secrets. Their dedication puts them at odds with those who wish to usher in the Inquisition and the End of Days. Both the contemporary and Fifteenth century narratives are intense, full of action, mystery and suspense and a great deal of self sacrifice. Its broad canvass references islamic terrorism, religious oppression, the pursuit of power and individual aggrandisement. It was evident that the author has done a great deal of detailed research to give a true flavour of historical authenticity to the plot. I knew little of Henry the Navigator or Queen Isabella before reading this book and although it is fiction, I feel that it has shed much light onto a fascinating period of world history. I enjoyed how it linked societies such as the Knights Templar and the Masons and explored ancient mysteries. The references to shipbuilding, navigation and naval exploration were also fascinating. To conclude, The Virgin of the Wind Rose, recounted by a master storyteller, is a thoroughly thought-provoking read, highlighting lessons and messages from the past which resonate in today’s fractured world. Recommended for lovers of thrillers, especially those that draw on ancient and esoteric mysteries. Please note that a copy of this novel was given to me by the author for the purpose of a fair and honest review. 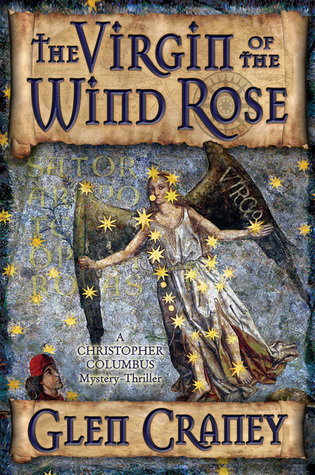 This entry was posted in Contemporary, Historical, Mystery, Review, REVIEWS (ALL) - Reverse Chronological Order, Thriller and tagged columbus, conspiracies, esoteria, glen-craney, knights-templars, masons, mystery, parallel-narrative, romance, secret-societies, the-virgin-of-the-wind-rose, thriller.